Definition: The dew point is the temperature to which a given parcel of air must be cooled, at constant barometric pressure, for water vapor to condense into water. The condensed water is called dew. The dew point is a saturation point. 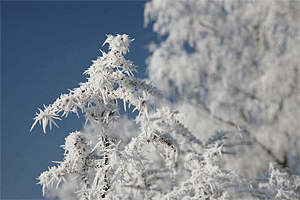 When the dew point temperature falls below freezing it is often called the frost point, as the water vapor no longer creates dew but instead creates frost or hoarfrost (the white ice crystals, loosely deposited on the ground or exposed objects, that form on cold clear nights when heat losses into the open skies cause objects to become colder than the surrounding air) by deposition. The dew point is associated with relative humidity. A high relative humidity indicates that the dew point is closer to the current air temperature. Relative humidity of 100% indicates that the dew point is equal to the current temperature (and the air is maximally saturated with water). When the dew point stays constant and temperature increases, relative humidity will decrease. At a given barometric pressure, independent of temperature, the dew point indicates the mole fraction of water vapor in the air, and therefore determines the specific humidity of the air. The dew point is an important statistic for general aviation pilots, as it is used to calculate the likelihood of carburetor icing and fog, and estimate the height of the cloud base. 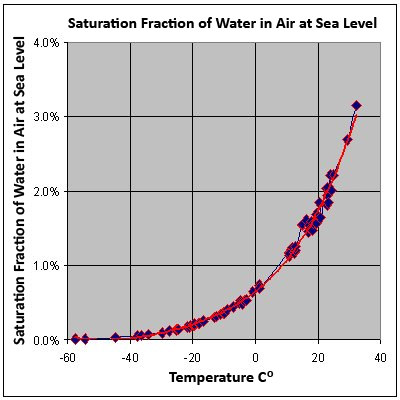 The graph to the right shows the maximum percentage (by mass) of water vapor that can exist in air at sea level across a range of temperatures. 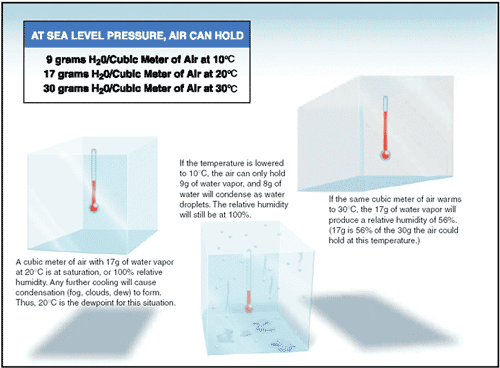 With higher temperatures, the equilibrium partial pressure of water vapor increases and more water evaporates. The behavior of water vapor does not depend on the presence of other gases in air. The formation of dew would occur at the dew point even if the only gas present is water vapor. Dew point is a monotonic function of the partial pressure of water vapor, so dew point can be determined from partial pressure of water vapor alone. At a given barometric pressure, independent of temperature, the dew point indicates the mole fraction of water vapor in the air, or, put differently, determines the specific humidity of the air. If the barometric pressure rises without changing this mole fraction, the dew point will rise accordingly, and water condenses at a higher temperature. Reducing the mole fraction, i.e. making the air dryer, will bring the dew point back down to its initial value. In the same way, increasing the mole fraction after a pressure drop brings the dew point back up to its initial level. For this reason, the same dew point in New York and Denver (which is at a much higher altitude) will imply that a higher fraction of the air in Denver, CO consists of water vapor than in New York. At a given temperature but independent of barometric pressure, the dew point indicates the absolute humidity of the air. If the temperature rises without changing the absolute humidity, the dew point will rise accordingly, and water condenses at a higher pressure. Reducing the absolute humidity will bring the dew point back down to its initial value. In the same way, increasing the absolute humidity after a temperature drop brings the dew point back up to its initial level. Coming back to the New York - Denver example, this means that if the dew point and temperature in both cities are the same, then the mass of water vapor per cubic meter of air will also be the same in those cities. Humans tend to react with discomfort to a high dew point (> 60° F). The body perspires and produces sweat to cool down. High relative humidity and consequently high dew point, prevent the evaporation of sweat and reduce evaporative cooling. As a result, the body may overheat, resulting in discomfort. Lower dew points (< 50° F) correlate with lower ambient temperatures, and the body requires less cooling. A lower dew point can go along with a high temperature only at extremely low relative humidity, allowing for relative effective cooling. Those accustomed to continental climates often begin to feel uncomfortable when the dew point reaches between 59 to 68° F (15 and 20° C). Most inhabitants of these areas will consider dew points above 70° F (21° C) to be oppressive.